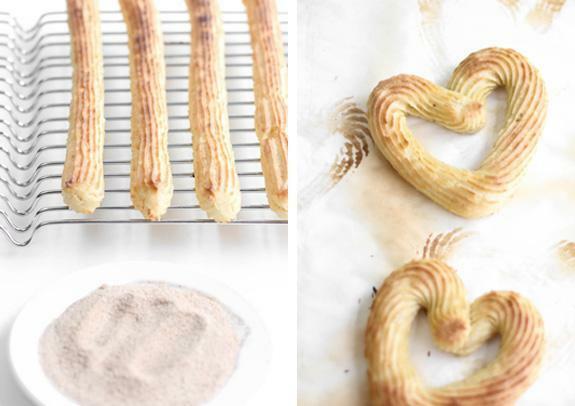 Here is our recipe for Baked Churros! Preheat oven to 425°F. Cover two baking sheets with parchment paper; set aside. In a medium saucepan, stir together 1 cup water, brown sugar and salt. Add butter and place over medium-high heat. Heat until butter is melted and mixture starts to boil. Remove from heat and add flour, stirring with a wooden spoon. Mixture will clump and pull away from the sides of the pan. Mix/mash with wooden spoon until no streaks of flour can be seen. In a small bowl, combine eggs and vanilla. Scramble mixture with a fork and then add to the dough-ball in the saucepan. Stir and mash, breaking up the dough until loosened. Stir well until eggs are incorporated and mixture has the appearance of mashed potatoes. Pipe dough into long thin lengths on the parchment covered pans. Use a pair of kitchen scissors to cut the end of the dough from the piping tip. Leave about 2-inches of space between the churros. Bake for 10-12 minutes or until slightly puffed and deep golden brown. Remove from oven and let cool slightly. Transfer to a wire cooling rack. Combine sugar and cinnamon and pour onto a long dish. Roll churros in mixture. Serve, the fresher the better! Mrs Lowes came to tell us all about Borneo. We loved hearing about what she packed in her case, how she travelled and all the exotic animals she saw! Animal Antics Fun ! Today we had a visit from Animal antics and we got to meet and touch lots of different animals. This half term we are dusting off our suitcases and going on holiday! We are enjoying finding out about other countries and soon will be studying our 'Eurokitchen' country, Spain. If you have been to Spain on holiday, please let us know, and perhaps we can share some of your memories and experiences. Use the globe / map to locate Spain, talk about what we already know about Spain... who has been? How would we get there? What transport would we need? Try foods from Spain e.g. Iberico ham, Manchego cheese, Seville oranges, churros, tortilla, chorizo. tricky word focus: like, little, some. come. We have loved our topic exploring our world's water, and the creatures that live in it. We have created sea creatures, pretended to be divers, and found out so many interesting facts. Please read our special book about Sea Creatures! The spelling might not be perfect, but we tried very hard to sound out the words we wanted, using our phonic knowledge. We researched our facts very carefully using the internet and non-fiction books. Our wonderful book about the sea. Reception children are blasting off into space! Here is our revised topic plan for this half term. Please pay special attention to the phonics we are covering, so that you can support your child in learning all the new tricky words. Check out the Youtube clips as well! These are songs about space which we love to sing together. See how many facts about the solar system your child has learned already! Protective Behaviours: when do we feel safe? How do we make sure we always feel safe? Let the StoryBots DJ "revolve" it with sweet beats as the rapping sun and planets give you their spin on the whole solar system. → http://sbot.co/1NQ11ni The StoryBots offer a world of learning and fun for kids and parents!